We can glean a meaningful understanding of the physical attributes of correctly schooled manege horses from the Baroque-era works of Van Diepenbeek, Newcastle’s trusted equine illustrator. Spanish? Nope. 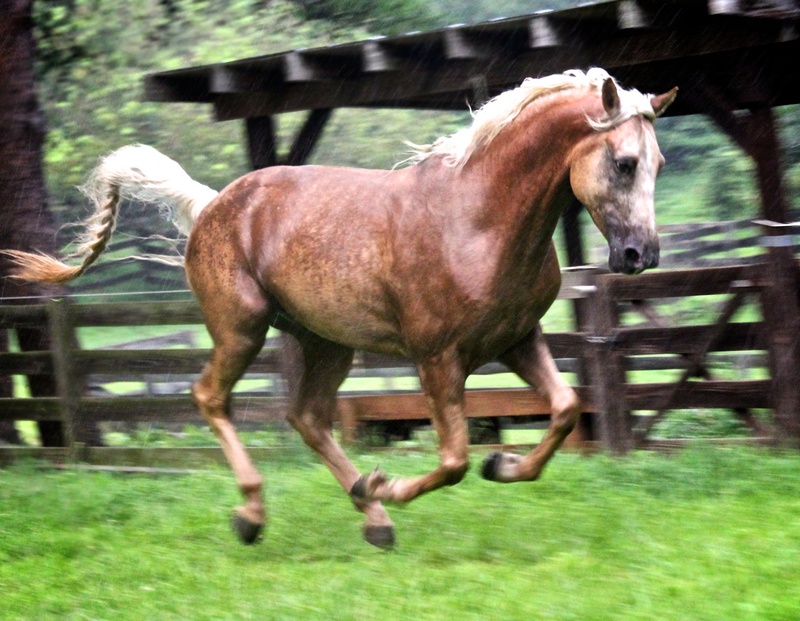 Americas first breed – as it was: Amigo is a 15’3 h Morgan gelding of the foundation type (pictured at 5 years) – and, specifically of the ‘working western’ family. Operated as a Spanish horse should be, however, his physique and posture have assumed the characteristics we associate with the term. The characteristics of Van Diepenbeek’s equestrian illustrations – compared to those of later artists such as Russell and Remington – are often dismissed as “less realistic” due to their almost perfect proportions. In fact, I suspect they more represent the real physical features of horses worked in a relatively collected academic posture. Virtually every horse lover I know also relishes artwork portraying images of the horse. If were are like me as a child, the one redeeming feature of grade-school was that, invariably, there was a library, and in that library were books – and some of them included pictures of horses. Of all the books, and all the pictures, certainly the horse is presented most strikingly, prominently, and brilliantly among Renaissance and Baroque era works – particularly the magnificent Dutch and Flemish artists, such as Peter Paul Rubens. 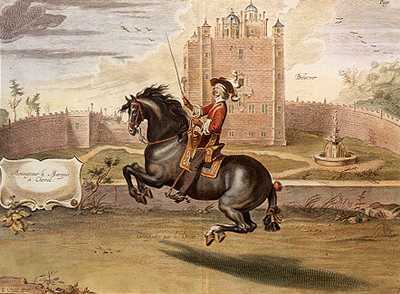 As it turns out, Rubens has a particularly interesting, though inadvertent, relationship to the perpetuation of high equitation via William Cavendish, 1st Duke of Newcastle, who, during his exile subsequent to the overthrow of Charles I and prior to the restoration of Charles II, resided at Rubens’ former estate in Antwerp (which had also been designed by Rubens). During this several year period of isolation and reflection, in the wake of losing virtually everything, and with little hope of redemption – Cavendish myopically retreated to his horses, and began writing the first of two manuals containing his opinions and observations surrounding horses and high horsemanship. As a part of this effort, Cavendish commissioned the Dutch artist Arthur van Diepenbeek (a student of Rubens), to illustrate his manuals on horsemanship. Van Diepenbeek’s style – especially in the portrayal of horses and landscapes – is unmistakably similar to his teacher’s. In fact, as was customary at the time, he, along with other understudies, would have contributed to a number of paintings attributed to Rubens himself. An illustrative plate by Abraham van Diepenbeek from Newcastle’s New Method. Not everyone has had the interest and opportunity to take an art history course, but most equestrians have at least a vague notion of the term “baroque” used as a descriptor of horses. The term implies a visual impression of ample strength, but also grace and refinement – as opposed to the simpler, less glorious chunkiness of the draft horse. Consider the impractical, relatively immobile bulkiness of the professional wrestler versus the inherently utilitarian (yet robust) physiques of ballet dancers, gymnasts, and martial artists. The baroque horse is not too large, nor too small (though, in any case, “small” compared to the relatively behemoth modern warmblood). From his stout, powerful body emerge refined extremities, tapering to an expressive, elegant face, and strong, dry legs. Pisgah’s Melody Rose circa summer 2015, with Henry Fleming. In good working condition, Melody well represents the “baroque” build which is so naturally predisposed to easy collection and high mobility. Now, in the world of art criticism, the term “Baroque” is occasionally used pejoratively by those who consider it a genre of art portraying figures so idealized they become not only unrealistic in and of themselves, but also and improbably similar among artists. And if everyone tries to portray only the idealized, perfect versions of everything, then, so the sentiment goes, the meaning of any particular work becomes reduced. Taken to its extreme, artists are simply painting the same perfect icons, leaving little room for individual expression, interpretation, and imagination (which, of course, was very much the point from the perspective of Baroque era patrons who, for their money, wanted works as impressive as they were unambiguous). The notion is underscored by a question the critically gifted have long posed to their pupils: Have you ever seen a horse like that in real life? As if on queue, a roomful of young sycophants responds: Wowee! You’re right! And again, too! I’ve never seen a horse that looked like that! 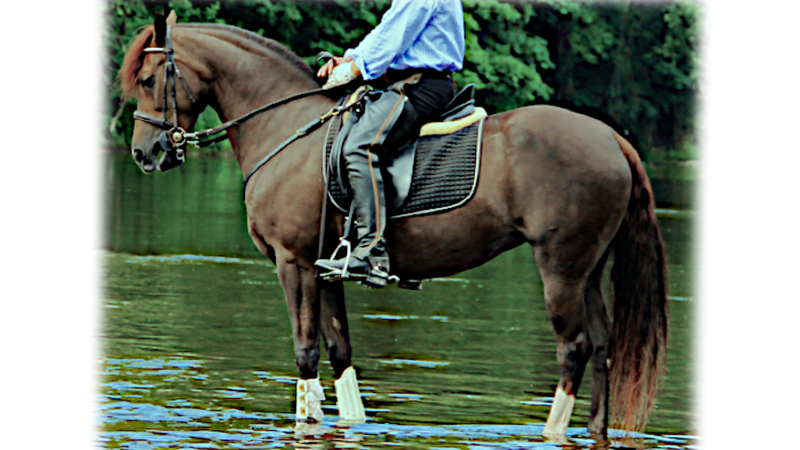 And, of course, they and the professor are probably right: they probably never have seen such a horse – and unfortunately the same is true for very many equestrians. But all parties forget that an idealized image is, by and large, merely an unlikely representation of particulars; that while it is unlikely this or that person (or horse), was indeed so exquisitely formed, this does not imply such perfection does not exist. On the contrary, the very fact of Baroque forms is a compelling case that such perfect examples existed – else on what would artists have modeled their figures? During the Renaissance, Da Vinci himself criticized Michelangelo’s fantastically musclebound supermen as resembling “bags of nuts” – going beyond the notion of portraying the artist’s ideal human figure, instead portraying, occasionally, anatomically impossible figures. Is this a case of “the pot calling the kettle black?” Not exactly. Because, in this case, the Pot, if you will, has produced images bearing some utility, if people in the future want to understand how things may have looked in the past. If I were having a portrait of myself painted to impress my peers and future generations, I might prefer my appearance be skewed a bit towards the, say, the Brad Pitt side of the house. It would need to be recognizably “me”, but maybe a little more in the shoulders; a little help with my uncertain hairline. Worst case, the artist flatters me and goes too far in the direction of Mr. Pitt. My family smirks when they see it. But Brad Pitt exists, and therefore is valid as a “tenable ideal”. The portrait may be of little value in later coming to a reasonable determination of how Henry Fleming looked (particularly in the absence of other portraits, by other artists), but will at least represent what a lucky few men looked like in my day. Had the artist used He-Man as a basis for his idealization (or, in the case of a female, Barbie), he would have gone far beyond the realm of a tenable ideal. The portrait would be worthless later in terms of providing a sense for how men looked – any of them, because the dimensions of He-Man are (at least so far) beyond the pale of genetic selection. The figure is not simply unlikely, it is impossible. Da Vinci’s forms were often no less idealized – only more exact in terms of the actual ideal itself, and thanks to his studied dissections of both human and animal bodies. Da Vinci is known to have been morally concerned with accuracy – at least in terms of the possible. 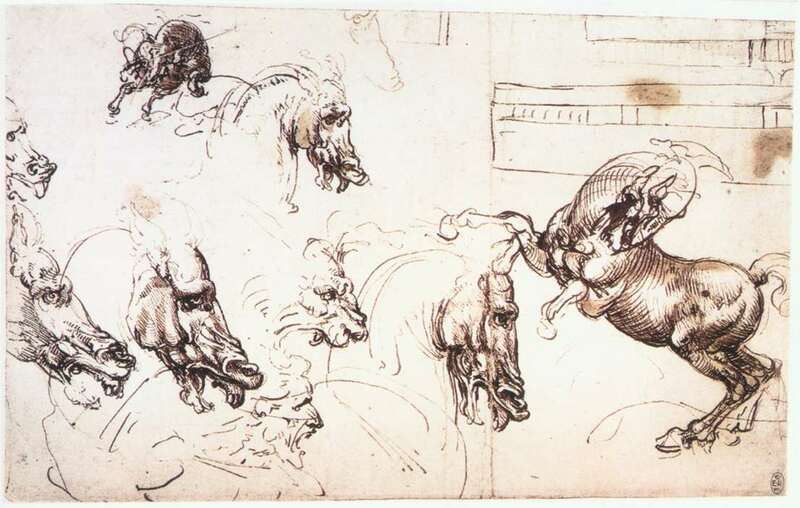 Da Vinci’s style, work, and moral commitment to the accurate presentation of beautiful forms (in terms of presenting a tenable representation) was later greatly admired by Rubens. Van Diepenbeek was an apprentice of Rubens, and presumably inherited much of his master’s “artistic morality”, if you will, in addition to his artistic technique and style. So, while we can rely on Van Diepenbeek to bring the prettiness and visual optimism which typify Rubens and the Baroque era, we may also presume he retains a “DaVincian” commitment to accuracy with respect to conveying at least tenable forms – even though particular subjects may have been themselves more or less only proximate to “the ideal” model. 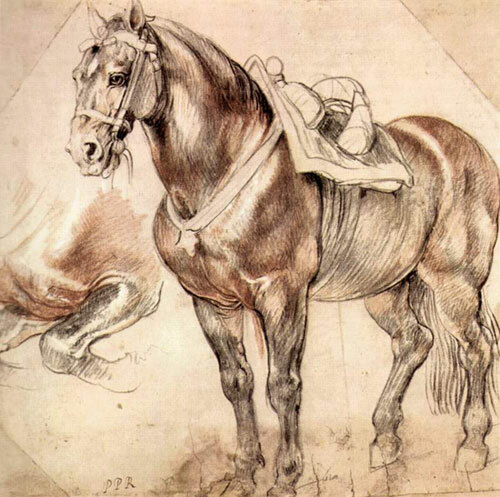 This distinction is essential, because in Van Diepenbeek’s case – certainly with respect to his work for Newcastle, his equine figures become even more constrained to reality, emerging as they did under the scrutiny of one of the most passionate, knowledgeable horsemen in history – a fact likely to have pushed these particular Van Diepenbeek illustrations even more towards Da Vinci’s end of the artistic “accuracy” spectrum, and further away from the “bag of nuts” risk for which Baroque art has been criticized. Van Diepenbeek’s realistic, tenable portrayal of Newcastle (from Newcastle’s A New Method) suggests we can rely upon a certain degree of accuracy and intent among his interpretations of Newcastle’s horses.